HOME: Offering the best Retail Firework Stores in Pennsylvania and wholesale fireworks PA for personal, industrial or event use. Explore our site from the Intergalactic portal (aka – our home page) HERE. PRODUCTS: Anytime of year, the holidays can be celebrated with dynamic fireworks celebrations! The best place to buy fireworks in PA is undoubtedly Intergalactic! View our product lineup, here. SPECIALS: We enjoy passing on savings to our great customers, so from time to time we offer fireworks discounts for upcoming holidays, as well as great savings on overstock or fireworks that we need to move quickly to make room for more! Browse special deals, here. BRAND: Looking for a particular brand of fireworks for sale in PA? We carry many of the biggest name brands in the fireworks industry. Take a look at the firework brands we have collected from around the globe. FIREWORKS GUIDE: Get the Fireworks Guide to help you get started on your way to having your first fireworks shop. The Fireworks Guide is available here, entirely free. ABOUT: Interested in learning more about Intergalactic Fireworks of Pennsylvania? We have enjoyed lighting up the night since childhood, so explore your inner child and find the largest collection of any Pennsylvania Fireworks Stores, here. LOCATION: Would you like to come to our retail fireworks store in Pennsylvania? Find our physical address and the best place to buy fireworks in PA! FAQs: Get answers to many commonly asked or frequently asked questions (FAQs) to explore the new hobby of fireworks! BLOG: Read and follow our Fireworks Blog for DYNAMITE tips, fun historical facts about fireworks and holidays, as well as many “how-to’s” for a wonderful resource! PRIVACY: Intergalactic Fireworks of PA respects your privacy. We never share your information, cookies or history with anyone, including vendors. Read our privacy statement. TERMS OF SERVICE: If you are interested in reading about Intergalactic Fireworks of Pennsylvania terms of service, you may find it here. 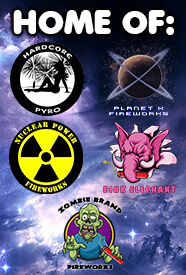 CONTACT: Intergalactic Fireworks strives to provide both wholesale fireworks customers and retail fireworks shoppers with a great customer experience. Contact us here with any comments, concerns or testimonials.